We are proud our courses have earned accreditations from relevant professional bodies. 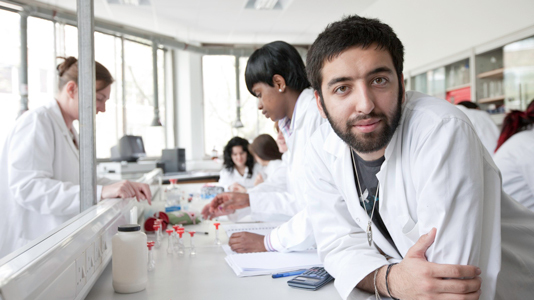 We offer undergraduate and postgraduate degree courses in biological sciences, forensic science and sports science. PhD research degree programmes are available and are supported by a supervisor, an expert in the field. A broad bioscience degree course that allows you to specialise later in the degree with modules focused on biochemistry, human biology, microbiology and environmental science. Offered full-time and sandwich basis. Accredited by The Chartered Society of Forensic Sciences, this degree is focused on applying scientific techniques to the investigation of crime. Offered on a full-time basis. Accredited by the Register of Exercise Professionals, this popular sports course is focused on the science of exercise, training, rehabilitation, injury prevention and athletic performance. Offered full-time. This degree programme in sports coaching and analysis is specifically designed for students looking for a degree that will help them to develop the skill knowledge and competencies to become a sports coach. It will develop the students' knowledge of the theoretical subjects that underpin high quality coaching and also develop high level skills in the analysis of sports. Offered full-time.